Here in Texas, we’re very slowly easing our way into fall. We’re celebrating that it’s no longer 100-plus degrees outside, but also still taking full advantage of our grills! We’re aren’t quite ready to whip out the pumpkin spice lattes just yet. I mean, let’s get real, we’re still wearing shorts. I love summer as much as just about anyone can, so I’m perfectly fine living where winter lasts about 4 days and fall is just as short. BUT on the other hand, I’m seeing all of my favorite food bloggers post their pumpkin recipes and I’m like WAIT FOR ME! But still, it just doesn’t feel right sharing pumpkin pancakes when I am still craving popsicles and ice cream in the blistering sun. My solution? I’m going to stick my pinky toe in the water with this Fig Arugula Salad. I love this salad because it is just ‘fall’ enough to feel like I’m not completely out of touch with the seasons, but I can also not sweat while making and eating it. 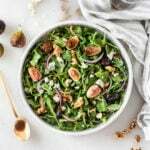 It’s full of seasonal goodies like fresh sweet figs and spicy arugula with just a hint of what’s to come with maple candied walnuts and dried cherries. It’s the perfect compromise between summer and fall. 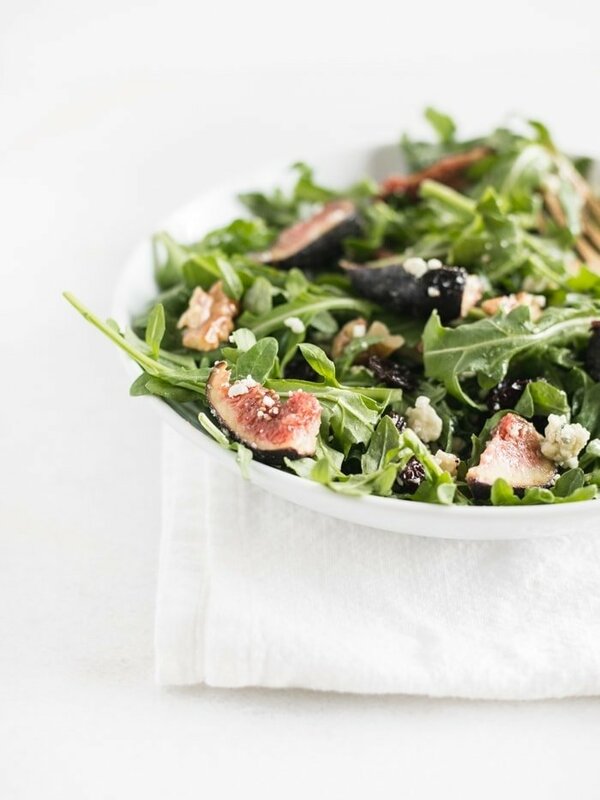 And as far as salads go, this fig and arugula salad is not only healthy, but super flavorful! The gorgonzola perfectly complements the figs and walnuts, while the peppery arugula provides a lovely green vehicle so that you aren’t just eating trail mix with a fork. 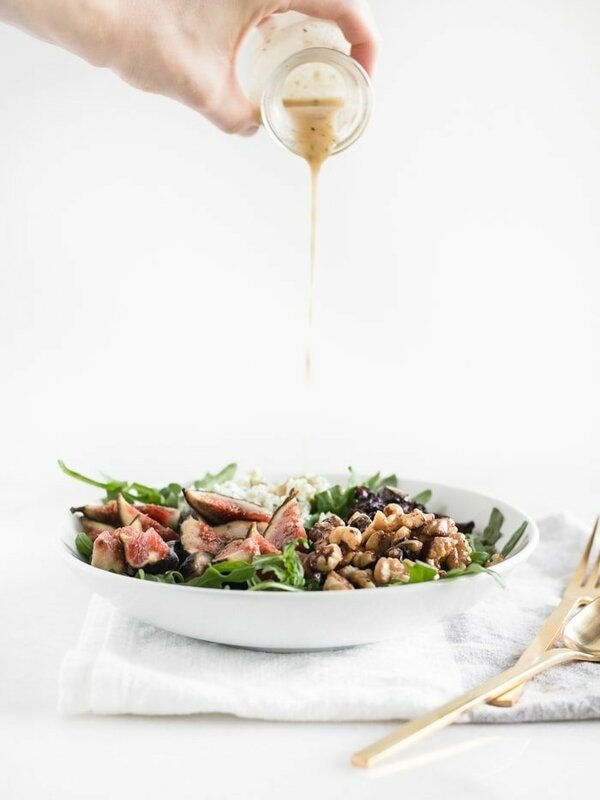 A simple maple dijon dressing is perfect on top, but balsamic would be divine as well. If you aren’t quite ready to pull out your scarf and commit to pumpkin everything, bridge the divide with this delicious fig arugula salad. Happy Fall, y’all! To make candied walnuts, spray a non-stick skillet with olive oil cooking spray. Add walnuts and drizzle maple syrup over them. Cook over medium heat until fragrant, stirring. Remove from heat and let cool before breaking into pieces. In a large bowl add arugula, sliced figs, gorgonzola, cherries, and cooled walnuts. To make dressing whisk together all ingredients. Toss salad with dressing and serve immediately or place in the refrigerator until ready to serve. This post was originally published September 2016. This just looks so light and refreshing! I love the combo of nuts + fruits + cheese in a salad! Great combo here and lovely photos! Thanks so much! I love cheese + nuts + fruit with or without the salad ha! What in interesting idea. I’ve had arugula in a salad before, but I’ve never put figs in one. I’ll have to see if I can find figs at my local store. This salad looks amazing …figs just make everything better! 4 days of winter sounds just about right to me 🙂 Thanks for sharing.